We have a special Dinner At The Winery planned for our wine club on Saturday May 19th: to celebrate of another release of our Apricots blend, we’re pairing up with local cookbook author Chef Robin Goldstein to create an evening of heady Mediterranean flavors and good company, all under the oaks that shroud our winery barns. served too, but this beauty is the focus of the evening. Click here to read the full story of Apricots! We’re excited to partner with Chef Robin (click to read more about her) in this effort. 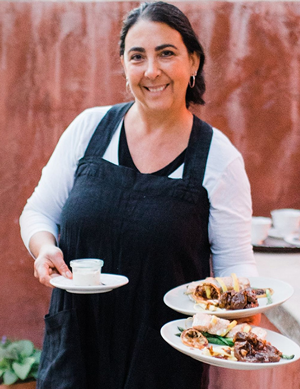 Over her 30-year career she’s studied at Culinary Institute of America, lead successful catering businesses, and has published three cookbooks, includingA Taste of Ojai and Simply Delicious Wine Country Recipes. Robin spent years traveling the Mediterranean, so influences from Italy, Spain, Morocco and the Middle East all pop up in her effusively flavored cuisine. Both the lamb and vegetarian dishes she crafted to pair with Apricots floored us, and we know it will you too! This dinner will be truly farm-to-table, showcasing much of the produce grown at the Tolmach farm’s garden, so we’ll kick things off with a tour of the garden first. Then we’ll tour and have a good chat about the new vineyard, which is planted with new and unnamed varieties with the potential to reshape grape-growing in Ojai and Southern California. 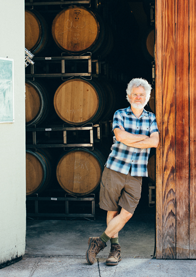 Then barrel tasting with Adam, a welcome spread, live music, and three courses with Chef Robin will make for an unforgettable evening.